ESTE (“Emergency Source Term Evaluation code”) is name given to the group of programs which serve as instruments for source term evaluation and calculation of radiological impacts in case of nuclear / radiological accident or as instruments for impacts evaluation of NPP normal operational radiological effluents. Systems are developed by ABmerit and are implemented for example at the Crisis Centre of Czech Republic under the State Office of Nuclear Safety in Prague, at the Incident Emergency Centre and at the Department of Nuclear Safety at the International Atomic Energy Agency (IAEA), as well as at the Austrian Ministry of Environment in Vienna and at the Crisis Centers of Slovakian nuclear power plants. The outputs and results of the ESTE systems are appropriate source of information for the crisis centers of nuclear power plants, national and international commissions of nuclear and radiation safety and moreover for the Integrated Rescue System (e.g. Fire Rescue Service). ESTE in its emergency response version has many modifications: ESTE EU, ESTE Mochovce, ESTE Bohunice, ESTE Dukovany, ESTE Temelín, ESTE Kozloduy. Systems ESTE EDU (Dukovany NPP) and ESTE ETE (Temelin NPP), both as client/server versions, are implemented at the State Office for Nuclear Safety, Prague, and serve as basic instruments for the crisis staff in case of nuclear incident/ accident. Systems are connected online to data from NPPs, to early warning system data (EWS, dose rates measured across the country) and to data from METEO service. Systems ESTE EDU and ESTE ETE are implemented also at the State Institute for Radiological Safety (SURO) in Prague. Modules for Dukovany NPP and Temelín NPP, both attached to the system ESTE EU, are implemented at the Crisis Centre of Austrian Federal Ministry of the Environment (BMLFUW) in Vienna. In case of emergency, both codes, the Czech SUJB ESTE Dukovany or Temelin and the Austrian ESTE EU, are automatically connected and data (state of the reactor core, prediction of the source term and estimated really observed release to the atmosphere) are exchanged between the Czech SUJB and Austrian BMLFUW systems, automatically. ESTE EU Kozloduy in client/server version is implemented in the Emergency Response Centre of the Nuclear Power Plant Kozloduy, Bulgaria, connected to real technological and radiological data. 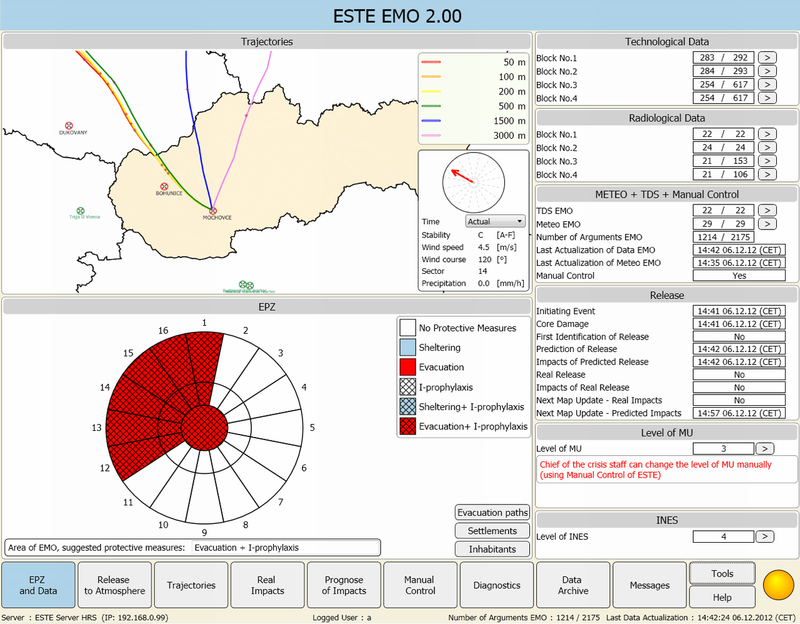 Systems ESTE EBO (Bohunice V-2 NPP) and ESTE EMO (Mochovce NPP) , both as client/server applications, are implemented at Slovenske elektrarne a.s., Bohunice V-2 and Mochovce NPP. Clients of the systems are implemented at the headquarters of the SE a.s. in Bratislava and the Emergency Response Centre of the Slovak Nuclear Authority (ÚJD SR). Systems are running on 2 servers with about 15-20 clients stations at various places at power plant. · The main task of ESTE is to predict projected (expected) release to the atmosphere (projected source term) and to calculate prediction of radiological impacts, to generate maps and tables with predicted avertable doses in the vicinity of the plant under various circumstances. This enables emergency workers to analyze feasibility and justification of measures and to impose urgent protective measures. · Prediction of the release to the atmosphere in pre-release phase is generated by the code if initiating event is detected (generally: loss of coolant through the containment or bypass of containment). Inevitable symptom of any initiating event in the code is radiation symptom of the breach of the barrier "boundary of the reactor coolant system". E.g. activity in the containment is above given level, or activity in the secondary circuit above given level is detected. · Once the initiating event is detected (it means that radiation symptoms of leak from the reactor coolant system are detected, too), ESTE automatically starts to generate prediction of the source term and calculates maps of avertable doses. Projected release is taken from database of pre-calculated source terms which is prepared and delivered every time as an organic part of the system ESTE. This database usually consists of 50-70 different pre-calculated source terms for typical distinguishable states of that specific reactor and spent fuel pool. · Maps of avertable doses and maps of other radiological parameters are calculated by ESTE using Numerical Weather Prediction (predicted meteorological wind field data) or meteorological data measured actually at the site (point values). · Predicted source term in the pre-release phase of accident serves to the incident response workers in order to know estimated expected amount of release and estimated impacts to the environment. Depending on circumstances (real safety situation, reactor is under control or no, etc.) the incident response workers can impose protective measures in the emergency planning zone. · As a result, together with other reported outputs of the code, such as the state of the reactor core, activity in the containment, activity in the stack identified, the emergency staff can suggest and impose adequate protective measures. · The main task of ESTE is to estimate real release of radionuclides to the atmosphere and to model and calculate movement of airborne radioactivity in the environment (from the place of release). This task is solved by continual evaluation of the response of teledosimetry system detectors placed at the NPP outside area and radiation monitors in ventilation stack of the plant. · Another task is to calculate radiological impact to the inhabitants, villages, evacuation routes, monitoring cars, ambulance cars, fire brigades, police. Various ESTE system outputs are useful and applicable for integrated emergency service. Using the interface of ESTE (desktop or mobile clients of ESTE systems) Integrated Rescue System have brief information about the number of inhabitants in the impacted area, about the towns which are located in the area and mainly also the important information about the need of specific urgent protective measures implementation. The results of ESTE systems for the Integrated Rescue System are available in various map and table formats. Emergency Service could use the ESTE geodata using desktop client or mobile client of ESTE software and browse the maps or text messages of radiation situation with the important parameters. · All results calculated by ESTE (maps of calculated radiological situation in the vicinity of the plant, symptoms of the state of the core identified, symptoms of initiating event identified, estimated level of INES identified, and many other calculated parameters) are archived in internal archive of the system and can be exported as txt files, or as "shp" files (maps), or as XML files (source terms), and subsequently shared with other systems. · ESTE systems are able to share each other the XML data with information about predicted or really observed release. This XML data can be exported and automatically read by other ESTE system.